In this post we are going to address a very misunderstood question/answer “Which Kills? Volts or Amps”. We are going to address this and answer the correct answer in a most understandable way possible. You landed on this page because you are naturally curious which parameter of electricity kills human. Some of you came here because your teacher or professor said it’s the current that kills you not the volts and you are cross checking. Some of you are wondering how I am alive after getting high voltage shock from a capacitor or from mosquito swatter. We will address everything and bust myths about volts and current. 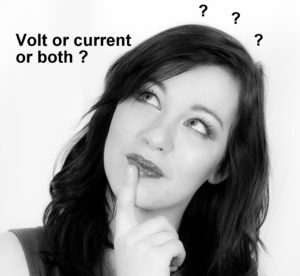 The answer to this question is more complex than saying that its volt or current. To get the full picture please read the full article. We need both volt and current and more importantly the energy to sustain the voltage and current long enough. The supply should have high enough voltage to overcome human body’s resistance and also it should able provide enough current and the voltage should not drop after contact with human body. Voltage is like pressure which pushes water, the pressure pushes the water from high pressure point to low pressure point or we also can say that the difference in the pressure that pushes the water. The difference in the electrical potential between two points is called volt, higher the potential difference, higher the voltage. Water is like quantity of charge flowing through the pipe and the pipe is the conductor and the diameter of the pipe is the resistance which limits the flow of water. Now let’s understand what happens when different quantity of electricity passes through human body. When 1 mA of current passes through human body, you will feel tingling sensation at the contact point. When 5 mA of current passes through human body, you will feel slight shock but bearable. When 6 mA to 30 mA flows through human body, you will feel painful shock and your muscles starts to contract and you can’t move. When 50 mA to 150 mA flows through human body, you will get extremely painful shock, breathing stops, flexing of muscles and permanent damage to tissue may occur, sometimes death is possible. When 1 amp to 4 amp current flows through human body, your heart will stop functioning, extreme muscle contract and permanent damage to critical organs, death is likely. When more than 10 ampere flows, you will face death soon with burns on you body. These are the likely outcome when your body touches high voltage source. Now you might say that above parameters are given in ampere, so the current is the one that actually kills people, right? Short answer Yes, for more clear answer keep reading, the current flow is one of the parameter that require to kill a person, but there is another parameter which is necessary to make such high current flow through a human body and that parameter is called volt. Now, we know that substantial amount of current flow through human body will kill human, but we need enough voltage to make such amount of current to flow across human body. A 12V car battery can produce 100s of ampere of current, but when we touch the terminals we feel absolutely nothing because the voltage is too low to overcome the human body’s resistance. But a 12V battery can easily overcome the resistance of a metal conductor with few milliohms of resistance, which makes the battery to push 100s of ampere of current and we will see the conductor glowing in red. Low resistance material like metal conductor, lower voltage is enough to make huge current to flow but much higher resistance like human body need higher voltage to make huge current to flow. So, the answer is both, we need enough volts to overcome human body’s resistance and the power source should able to supply high enough current without dropping the volt after touching. 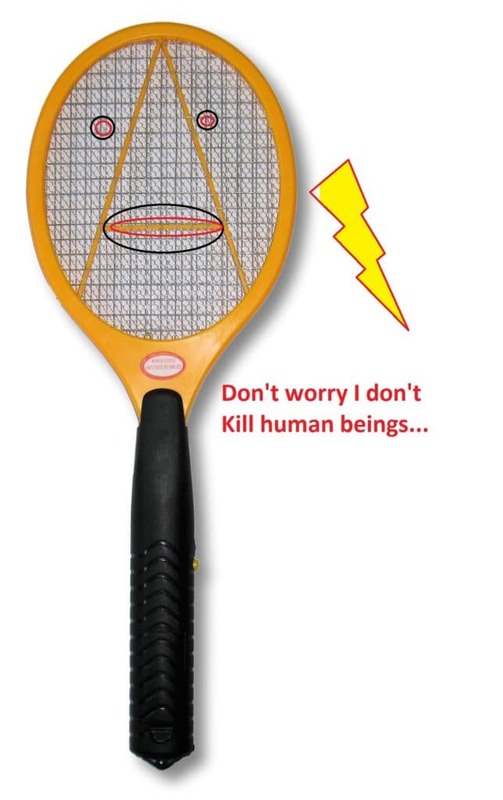 Why mosquito swatter bat or Taser gun don’t kill people? 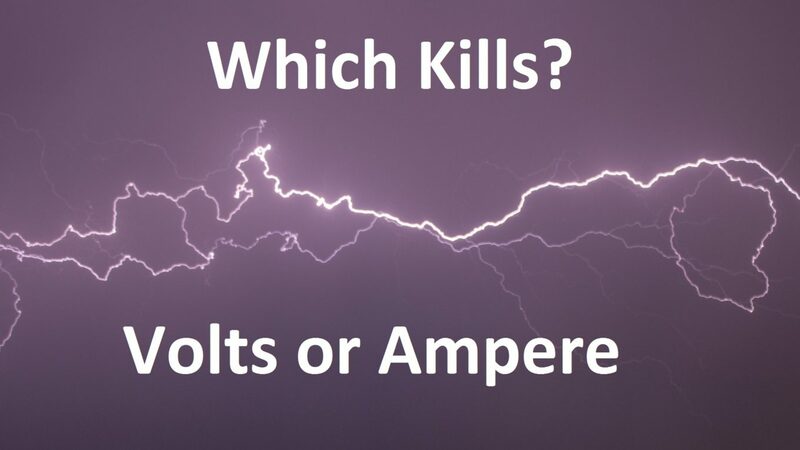 We are going to address another misconception which is leading to volts or amps fight. Mosquito swatters can deliver 2000V on a stroke and Taser gun produces 50,000V on average and people say I was not killed by Taser gun or the swatter because the current was low. Their understanding is wrong, the correct statement should be the mosquito swatter / Taser had low energy. The 2000V and 50KV are open circuit voltage, which is before the contact to the body, but after the contact to the body the voltage reduces to few hundred volts which make the current to flow less through the body. Thus it only gives shock but not enough to kill a human being. 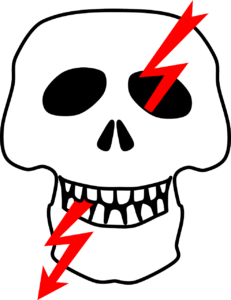 If the 2000V or 50KV sustained after contact with the body, then it will kill them immediately. To sustain higher voltage after the contact, the power source should have enough energy. The AC mains or power inverter with 120V/230V is enough to overcome the human body resistance and it will not drop the voltage (because the energy is not limited like a mosquito swatter) which will pump the current with no control which leads to death (If exposed to prolong enough). If the supply’s energy is limited the voltage will drop quickly, which will leads to drop in current and might not kill people. Example: Mosquito swatter. If you have any questions regarding this post, feel free to comment, you can anticipate a guaranteed reply from us.